Cardiff Fire officially opened the newly named Viola Arena in Cardiff Bay with a sensational 6-5 victory against Romford Raiders. 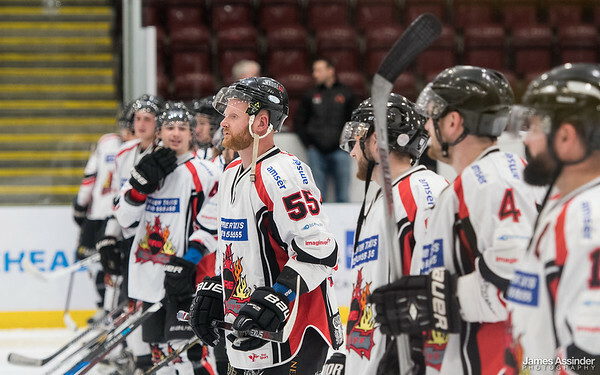 Former Devils player Mark Smith was in charge for the first time following the departure of player-coach Chris Douglas and the Fire players did him proud. Essex visitors Raiders powered into a 3-0 lead soon after the halfway mark and Devils were trailing 3-1 going into the third. Captain Alan Armour and his Fire players levelled the score at 3-3 before Romford regained control at 5-3. Cardiff Fire. Pic: James Assinder. But Smith’s team have heart, aggression, power, intensity and a spirit which carries them through adversity. There were fights, goals – and a home victory. Earlier this season Fire ripped into Bracknell Hornets, scoring four goals in the last eight minutes 13 seconds and won 10-9 thanks to a sudden death overtime winner by Tamas Elias. Cardiff netted three times in three minutes 29 seconds near the end of the third period to win by the odd goal in 11. Jordan Powell scored after 51-36 and Jackson Price netted on 53-57 to make it 5-5. It was Welshman Powell, a 26-year-old from Barry, who fired the winning goal at 55-05 and clinched victory in their final match of 2018. The next home match for Cardiff Fire is against Chelmsford on Sunday, January 6, while they entertain Guildford on Saturday, January 26 and Oxford visit the Viola Arena the following evening. Scorers, Fire: Jordan Powell 3+1, Joe Morris 1+0, Stephen Deacon 1+0, Jackson Price 1+0, Alan Armour 0+4, Elliott Murdoch 0+1, Tamas Elias 0+1, Ross Wilkinson 0+1, Sam Bryant 0+1, Josh Haslam 0+1, Ellis Sheppard 0+1. Raiders: Tommy Huggent 2+1, Matt Brown 1+0, Kamil Kinkor 1+0, Ewan Hill 1+2, Brandon Webster 0+1. Period scores (Fire first): 0-1; 1-2 (1-3); 5-2 (6-5). Penalties in minutes: Fire 12+8+12=32, Raiders 10+4+8=22.